Version control systems are divided into two groups: “centralized” and “distributed”. Centralized Version Control Systems (CVCSs) and Distributed Version Control Systems (DVCSs) serve different needs in software development. In this blog post, we'll describe them and list some of the main pros and cons of both systems. Centralized Version Control Systems were developed to record changes in a central system and enable developers to collaborate on other systems. Centralized Version Control Systems have a lot to offer, however they also have some serious disadvantages. Distributed Version Control Systems (DVCSs) don’t rely on a central server. They allow developers to clone the repository and work on that version. Develops will have the entire history of the project on their own hard drives. It is often said that when working with Distributed Version Control Systems, you can’t have a single central repository. This is not true! 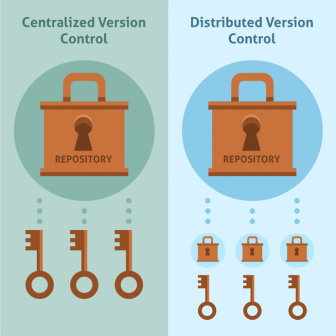 Distributed Version Control Systems don’t prevent you from having a single “central” repository. They just provide you with more options. codeBeamer ALM adequately supports development in any environment. To learn more, contact us with your questions, or get your free evaluation copy.